Thanks to exciting new technology, it’s now possible for some patients to get dental implants and new teeth in a single surgical procedure that takes just about an hour. Teeth In An Hour™ is a new, more convenient way to replace missing teeth. With typical dental implant surgery, patients had to wait for several months after the initial procedure before getting their new teeth in order to allow adequate healing time from the initial surgery. But, for patients with adequate bone density, the precise Teeth In An Hour™ system allows the implant post to bear a load immediately. Not only can you have your new teeth in your mouth in just an hour, you may also be able to eat with them the same day! Call Dr. Singh today to find out if you’re a good candidate for Teeth In An Hour™. How does the Teeth In An Hour ™ system work? Teeth In An Hour™ combines advanced surgical techniques with sophisticated computer technology and precise planning. Using CT scans of your jaw and three-dimensional computer modeling, a precise surgical template is created in order to ensure exact positioning of dental implants before your procedure even begins. 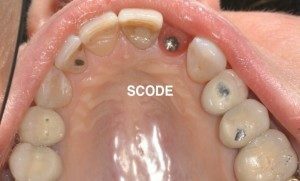 Because implants fit exactly in the surgical sites prepared for them, there’s no healing time required before replacement teeth are placed over the posts. The Teeth In An Hour™ system results in more accurate placement and less time for you at the dentist’s office. Bone of poor quality and quantity, that may not be suitable for Dental Implants Over time, the jawbone associated with missing teeth atrophies or is resorbed. Today, with Dr. Singh’s advance training and experience, we have the ability to grow bone where needed. This not only gives us the opportunity to place implants of proper length and width, it also gives us a chance to restore functionality and aesthetic appearance. Dr. Singh will review all available options with you.